The shark fishing in Charleston, SC has proven itself to be a premier location for enthusiasts. The warm waters and geographic proximity to the gulf stream lure in large predators from miles around. Maintained as a sport fishery above all else, these toothy predators are finally being recognized for their value to the ecosystem as a whole. If you are eager to hook into the area’s apex predator keep reading to find out more about shark fishing. Just like other ecosystems on the planet, the apex predator plays an important role in regulating a healthy environment. In South Carolina, the reefs are kept healthy by the presence of sharks. Without them, certain species of fish will overpopulate and strip vegetation away, destroying valuable habitat for baitfish. Instead of an increase in fish, there will be a decrease without sharks. In the past 10 years, all of the largest shark species on the Eastern Seaboard have declined by 50%. This has not been good for the local economy. The scallop fisheries and other bivalve harvests have been decimated by a huge increase in the ray population. And this example is just one that we can measure. Sharks have been part of the oceans for over 100 million years, without them, everything changes. The decimation of sharks has been in large part due to commercial fishing. Extracting a resource like a shark brings in money – plain and simple. However, if that shark was more valuable alive, there would be more incentive to keep them in the water. At RedFish Charters, we take sustainability seriously which is why we fish for shark. Anglers from around the country want the chance to tangle with one of these monsters and it’s in everyone’s interest to practice catch and release. 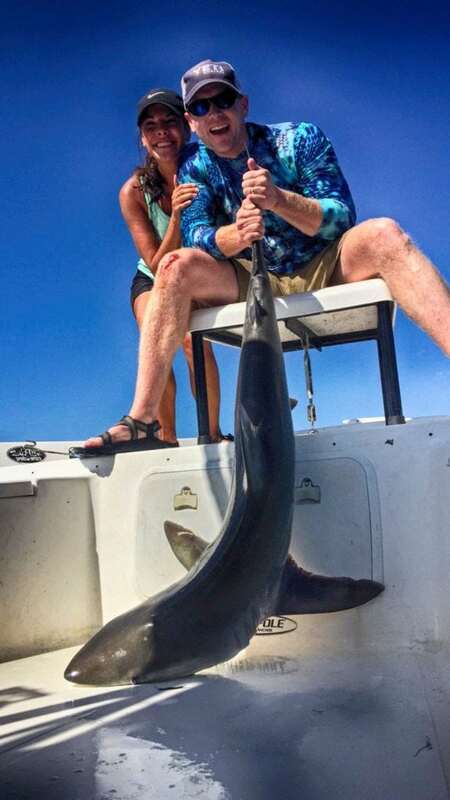 When you book a charter for shark fishing, you are helping the conservation movement. Just like duck hunting helped save millions of acres of wetlands on land, shark fishing is revitalizing Charleston’s fisheries. On top of the benefits shark fishing brings to the overall ecosystem, it’s also a whole ‘lotta fun. The species diversity found in our waters means you never know what’s going to be at the end of your line. Each species provides a unique fishing experience. Some of the sharks get big, really big, we have pulled in specimens weighing over 250lbs. The size of the fish means fighting for up to an hour. When you hook into something that big, all you need is one fish. While many people fear shark attacks, they are such a rare occurrence that it’s not even worth dwelling on. Besides, when you’re shark fishing, you’re in a boat, not the water. RedFish Charters is proud to offer shark fishing trips, designed at putting you where the fish are. Learn about the various shark fishing packages available and get fishing today.